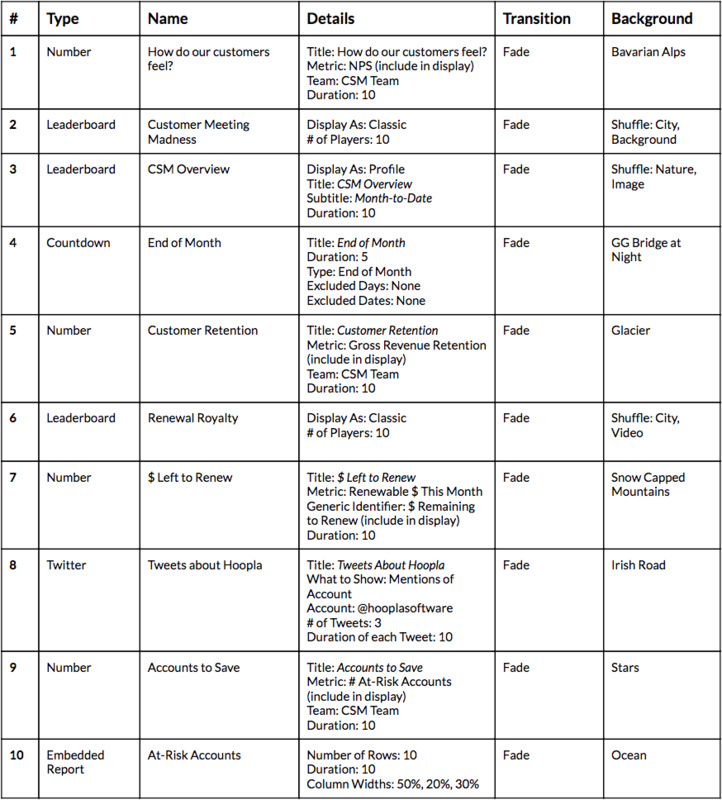 Want to broadcast metrics that reflect customer health and success? The CSM team is crucial to your company’s success. They’re on the front lines talking to customers, working with them to ensure that each customer sees value in your product. Their efforts often go unnoticed by other parts of the company, but Hoopla solves that problem by showcasing KPIs on TVs throughout your office. With Hoopla, the entire company can stay apprised of customer health at a glance. Looking to keep your Customer Success team focused on renewals and expansion opportunities? Rally your team around the right metrics by displaying Leaderboards that showcase top reps for renewals and expansions. Set up a Newsflash that triggers when the team hits its target renewal rate, celebrating their efforts and encouraging them to keep pushing. Recognizing your team for the important work they’re doing will create a culture of celebration and motivate them to new heights. 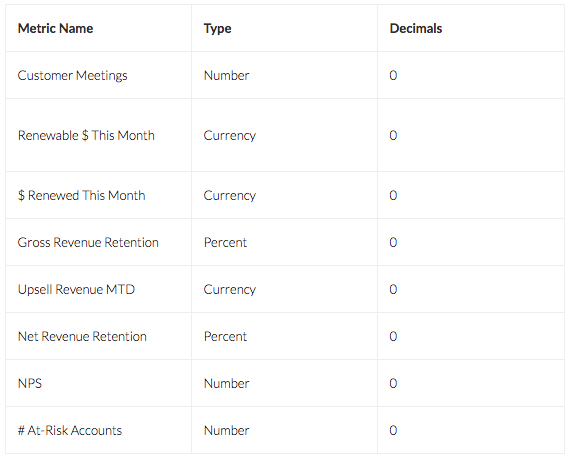 Need a way to bring visibility to churn numbers and at-risk accounts? Churn affects the whole company, but gaps in inter-department communication can mean that churn goes unmitigated or worse - unnoticed. Hoopla can help involve the whole company by bringing visibility to the churn data and displaying a list of at-risk customers. You can even set up Newsflashes that trigger when an at-risk account is saved! Check out this demo channel to see how Hoopla can make an impact in a Customer Success or Customer Care department! Add your Customer Success team as Users. You can add them manually, but if you plan to use the Salesforce integration to update Metrics automatically, add the users there instead. Create a Team called “CSM Team” and add the appropriate users to that team. Again, if you’re using the Salesforce integration, manage the CSM Team membership there instead. Define some Metrics under Configure > Data > Metrics > Add. 5. If you use Salesforce to track everything, set up the Salesforce integration so you can automatically update your Metrics and trigger Streaming Newsflashes. 6. 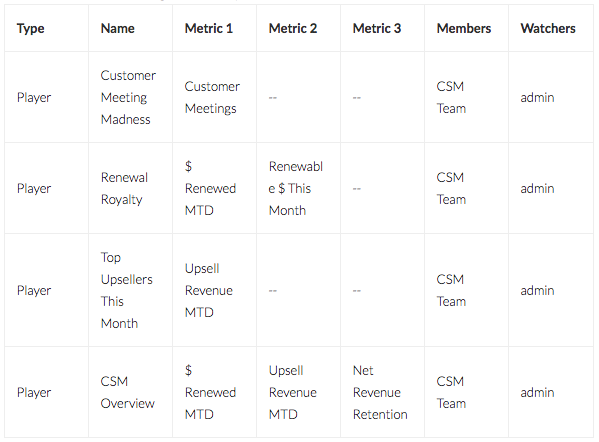 Many Customer Success metrics are results of calculations. Our Google Sheets integration makes it easy to perform those calculations and upload the results into Hoopla. Use these instructions to set up the integration and start importing your Metric values. Metrics like Gross/Net Renewal Rate and NPS can be represented with Generic Identifiers or Team Metric values, depending on how you want to show them. If you don’t want to use Google Sheets to sync certain metric values into Hoopla, you can update those Metrics manually under Configuration > Metrics > (edit each Metric). 8. Define a Team Metric Newsflash that recognizes when the Team achieves the targeted Gross Revenue Retention rate. 10. Configure a Quickfire Newsflash to enable you to broadcast announcements on-the-fly. Call it “Customer Success Announcement” and use it to send kudos to colleagues or send out reminders to the team. 11. Configure your Channel by clicking and dragging desired components into your Lineup. 12. Add Newsflashes to your Channel. Add Newsflashes to your Channel to celebrate important achievements or make on-the-fly announcements. Within the Newsflashes dropdown, you should see your “Customer Success Announcement” Quickfire Newsflash, along with your Team Metric Newsflash “Goal Retention Rate”. Add a Newsflash step for each Newsflash you wish to see fire on your channel. If you created a Salesforce Streaming Newsflash to celebrate closed-won renewals, add that too! 13. Add Ticker sources to your Channel. Slack Integration - post announcements to Hoopla TV and update Metric values from within Slack! Zapier Integration - connect with hundreds of other internet apps to update Hoopla Metrics or trigger Newsflashes. Add an Activity Recap step to your Channel once you have several Newsflashes triggered (found in Config > Channels > Available Steps). This will highlight recently-triggered Newsflashes, in case they were missed on TV.